This book is about a man made miracle. Napoleon invaded Russia in 1812 with roughly 600,000 men all total. By early 1813 he was back in Paris, and the Grande Armee probably had only 60,000 soldiers, and half of those should have been in a hospital bed. Napoleon had slunk back across Europe, and was back in Paris. Napoleon was now to add another title to the long list of monikers he was given. Along with Emperor and Ogre, you could now use the word magician. He was able, like a stage magician, to pull something from his hat. In this case it was a new army. When he took the field in April 1813, he actually had more soldiers in his army than the Allies had in theirs. This campaign and book is about those young soldiers, the Marie-Louises (named after Napoleon's second wife). These men/boys were able to march and fight almost as well as the few grizzled veterans still with the colors. Dr. Nafziger has put another feather in his cap with this book. He is able to move seamlessly from the political to the military sphere. He also effortlessly goes from the strategic to the tactical without missing a beat or losing the reader. The book itself is filled with black and white illustrations of the generals and other players. It also comes with a twenty-one page color section of maps. To top it off, in true Nafziger style there is an Order Of Battle that is almost 100 pages long. The book shows how Napoleon appeared among his enemies like a thunderclap. If it wasn't for some extremely bad luck and some very bad judgements of some of his Marshals, along with a lack of cavalry (Napoleon, for all his work, could not produce horses out of his hat). Napoleon should have scattered this group of enemies just as he had the earlier ones. Unfortunately for Napoleon, and possibly Europe, the wheel of fate had turned. Even more than the 1814 Campaign, this one is adrift in what ifs. No matter how brave the young Marie-Louises were, they still died in droves. 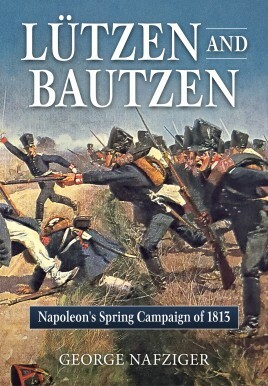 Napoleon was able to win both of the battles of Lützen and Bautzen, but due to his lack of cavalry he could defeat them but not crush them. The book goes from the back drop of the 1812 Campaign to the armistice in early June 1813. The author is able to take the reader to the battles and councils of both sides of the conflict and bring them both to life for the reader. Thank you for giving us another great book on Napoleon's campaigns, and especially for a book on the Campaign of 1813. I eagerly await the next one on the Battle of Dresden, and the second half of the campaign.